Identify paths, or strategies, to get there. Once a static, calendar based task falling in the domain of the planning department, today�s planning follows a more dynamic model where strategic decision making occurs continuously within the organization. The fast pace of change in the global economy dictates that business leaders have to evolve their strategies �on the fly� as new opportunities or threats emerge. They must listen and learn from their customers and from the employees who serve them. This type of strategic management requires increased input and collaboration from key knowledge workers in the organization. Room must be made for innovative thinking, so the environment in which strategic planning takes place must be open and receptive to new ideas. When successful, this new participatory and open style of discussion results in a strategic plan that is much more relevant to the business. But the planning process itself is more challenging to manage. Those leading the charge often get caught up in �processing the process�, going through endless iterations in an effort to capture everyone�s view and reach consensus. The result is a process that gets bogged down. The danger is that as participants begin to feel unproductive, their frustration leads to disengagement. Therefore, what starts out as a collaborative endeavor often becomes an inefficient and exasperating exercise. Incorporating collaboration technology into the process is one way to remove the roadblocks to collaborative strategic planning. This technology speeds up and refines the planning process by dramatically increasing participation on the one hand and productivity on the other. It enables more knowledge workers to engage in a highly effective progression of data gathering and idea generation, leading to a thoroughly documented set of prioritized issues and solutions. It also provides a forum for continued collaboration so that the plan becomes a �living� document that plays an ongoing role in strategic decision making. Group collaboration technology emerged in the early 1990s with the advent of desktop computers and client-server networks. Referred to as �groupware�, computer applications such as email, newsgroups, shared authoring systems, chat rooms and group decision support systems, were designed to facilitate the work of groups. By the late 1990s, the Internet fostered an explosion of web-based collaboration technologies, among them web conferencing, team workspaces, content management systems and online meeting software. In general, collaboration technology promotes participation because it makes meetings easily accessible. People can participate in most web conferences and online team rooms using a basic web browser. The ability to archive group events makes it possible to participate in both synchronous (�real-time�) and asynchronous (�different times�) activities. And the technology makes it feasible and cost effective to include geographically dispersed knowledge workers. 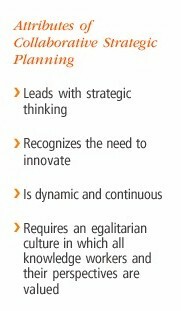 All this facilitates the dynamic, continuous and opportunistic nature of strategic planning today. Anonymous parallel brainstorming produces a higher number of ideas with more novelty resulting in productive �out-of-the-box� thinking. Participants control their own brainstorming process first by contributing their own ideas and then considering the ideas of others. This often generates another round of creative thinking. WDSS allows more knowledge workers to contribute their experiences by increasing accessibility, regardless of location and time. It also facilitates a higher volume of input by providing the ability to parallel process (contribute ideas concurrently with others across multiple topics). The result is greater depth and breadth of thinking on the given topic. WDSS boosts productivity in two ways. First, the automated capture of ideas and evaluation online lets the facilitator monitor progress and make immediate information available to participants. Second, the anonymity option has a profound effect on a group�s ability to move through a process without becoming stalled by difficult debates and entrenched positions. It levels the playing field, especially in hierarchical organizations. WDSS facilitates rational and even-handed decisions. Because everyone has an equal voice and an equal chance to be heard, participants listen differently and less judgmentally. Ideas, regardless of the source, tend to be more carefully considered. WDSS speeds up decision making. With anonymous voting the group moves quickly from divergence to convergence through a series of narrowing, evaluating and prioritizing steps. Because some of the negative aspects of group dynamics are removed and participants feel they have been heard, they tend to stay engaged in the process and show greater buy-in to decisions. Let�s return to our CEO from the beginning of this article and follow the process that was undertaken in 2004 by Electrogrid, the pseudonym of a private corporation with both federal and state mandates to build and manage the electrical grid. Deregulation of the electrical utility industry had created a complex and uncertain environment in which to create an efficient marketplace providing open, non-discriminatory access to electric transmission services. Increased scrutiny by government regulatory agencies and the resulting compliance requirements, coupled with public skepticism, had created a public relations challenge and a highly charged internal political environment. Previous attempts at strategic planning had failed due to lack of buy-in by the corporation�s managers, starting with the 36 directors. Some of the issues raised were lack of trust among the leadership team and lack of input from those in the trenches. Electrogrid selected Facilitate.com 8.5, a web-based decision support applica-tion, to support both the pre-work and the planning workshops. 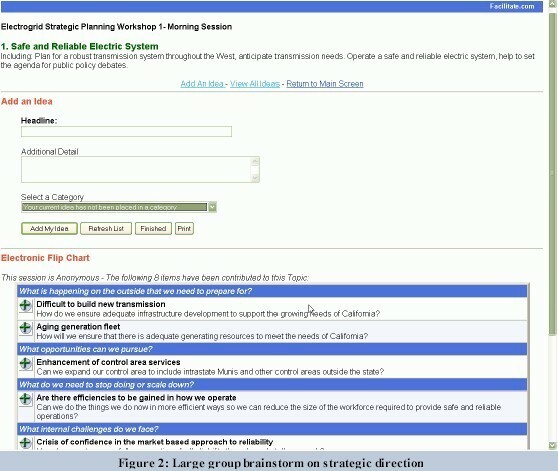 Facilitate.com 8.5 provides tools for brainstorming and categorization, prioritization, voting, action planning, surveying and reporting. 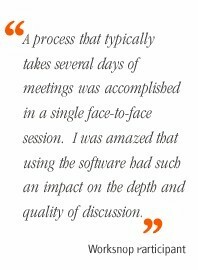 An important factor in the selection of Facilitate.com 8.5 was the ability to set up online surveys and discussion forums allowing the directors to participate from their offices and to identify key focus areas for the workshop. Another deciding factor was the expectation that the anonymity provided by the brainstorming tools would allow for an open and thorough sharing of ideas and give everyone an equal voice in the strategic thinking process. As the facilitators, we chose to intersperse a variety of online activities with traditional face-to-face discussion and small group break-outs. We designed the physical layout to accommodate all these activities. A large conference room was divided into two sections. On one side, classroom style tables faced several wall projection screens. A network with access to the company�s intranet was installed so that each participant could connect in with his or her laptop computer. On the other side of the room, we set up several tables for small group discussion, each with one intranet access point. A printer and copier were located nearby. The process consisted of six steps (see figure 1). We used traditional and technology assisted techniques to identify the strategic areas that the group would focus on during the one day planning workshop. The CEO and his officers took part in face to face interviews, while the thirty-six directors gave their input in an online survey and an online discussion forum. The CEO and the officers were able to review the online input and request clarification. 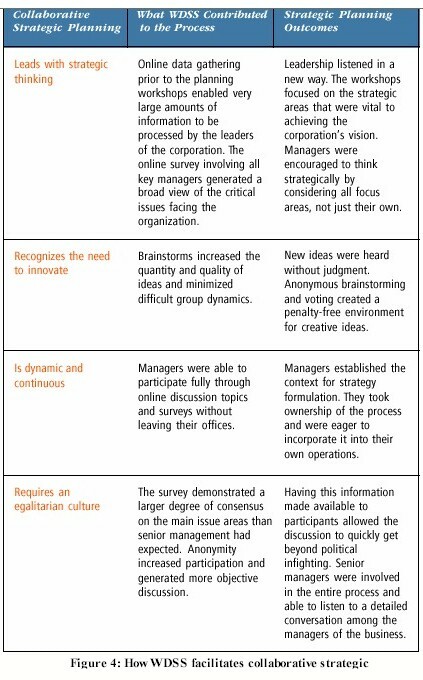 They then formulated seven strategic focus areas for the organization. The morning session kicked off with the CEO�s review of the corporate vision. The next item on the agenda was the Environmental Scan. The objective was to capture as much knowledge about Electrogrid�s environment and key issues as possible. To encourage divergent thinking, the format for this session was anonymous large group brainstorming using Facilitate.com 8.5. 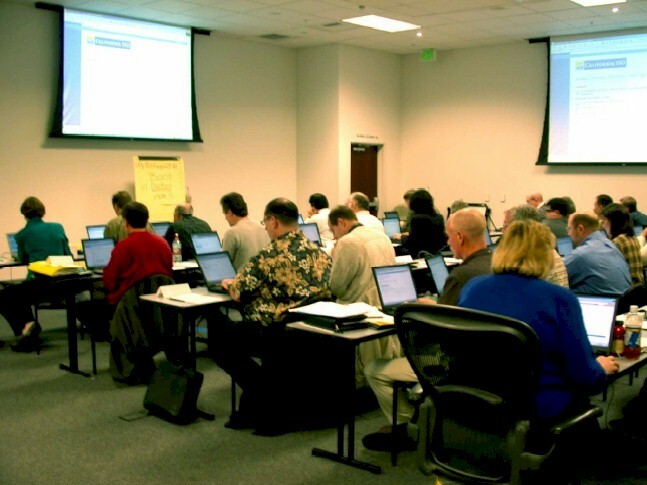 Sitting in the conference room, managers entered comments concurrently into their computers, quickly exchanging and documenting ideas on electronic flipcharts. With anonymity ensured, they wrote frankly and read with an open mind. Within thirty minutes, the Environmental Scan produced two hundred well-documented issues of concern to the organization. The group spent the next 90 minutes commenting on the strategic focus areas. Each focus area was set up as a separate topic with the same series of questions. Participants were allowed to move freely between topics, spending time where they felt they had the most to say. After an hour and a half, each of the seven topic flipcharts contained twenty-five to forty ideas (see Figure 2). The objective of the afternoon session was to consolidate the large group input into a series of strategy recommendations. To facilitate convergent thinking, self-selected small groups representing each of the seven strategic focus areas were directed to develop a strategy brief describing intent, outcomes, challenges and assumptions. They were also charged with identifying the appropriate measurements of success. No technology was used in this activity. Instead, the groups were working from printed reports documenting the results of the large group brainstorms. By mid afternoon, the small groups had produced draft strategy recommendations. These were presented to the group as a whole, who were asked to comment online and vote on how well each recommendation addressed key issues. (See Figure 3). 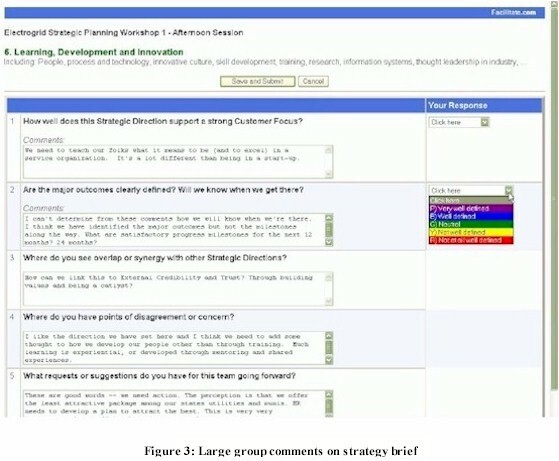 In this exercise, the technology enabled group members to comment freely and honestly, while giving them a structured thought process to keep the discussion focused. Participants had a say on all topics, regardless of their functional area of expertise. The strategic focus teams continued to work over the next four weeks to refine strategy recommendations. The large group then reconvened for one day to test the strategy recommendations using three scenarios. Once again, the juxtaposition of small group work with several iterations of anonymous feedback by the large group made it possible to rapidly refine the recommendations while allowing everyone to have their say. How will the corporate strategic plan affect the business planning of my division or department? What will I do to incorporate strategic thinking into the on-going life of the business? A small group of managers volunteered to work with the Director of Strategic Planning to develop the budgets and controls to complete the strategic plan. How did Electrogrid�s experience measure up against the attributes of good collaborative strategic planning? The strategic planning process at Electrogrid was transformed from unproductive and irrelevant into one that everyone agreed was productive and worthwhile. The use of collaboration technology made it easy for all key knowledge workers to participate and encouraged creative brainstorming within a structured framework for strategic thinking. The following table sums up the outcomes of Electrogrid�s strategic planning process and the contribution of web based decision support software. As the old saying goes, �where there is a will, there is a way�. The first step is to decide to adopt a dynamic and participatory strategic planning process. Then, the incorporation of web-based decision support software will provide the tools to structure the strategic discussion so that the process moves forward, new ideas are encouraged and decisions are made objectively. WDSS is simple to implement and it�s easy to justify the cost based on savings from reduced travel and meeting time alone. Most significant, it is an effective way to integrate the knowledge and creativity existing within your organization into your strategic planning process. Make sure that the technology supports, rather than drives the process. Use it only when it adds value. Use asynchronous collaboration (surveys and online topics) to gather information and identify important topics. Use real-time collaboration for prioritization and decision making. Large group brainstorms work well for data gathering and small groups for building recommendations. Use pre-workshop brainstorming online as a way to gather data and give yourself time to design the next steps. Use anonymity effectively, especially to help break through barriers of hierarchy and politics. Don�t use it when the team is productively focused on developing a solution. Electronic voting is a quick way to check on the degree of consensus � and move the process along. Sometimes it appears that people are disagreeing, but in fact they are in agreement and simply enjoying the debate! If you don�t have a good process, technology won�t help you. Make sure the process is sound. Using technology in the same time, same place is a great way to start the planning process. Continue to use the technology any time, any place after the workshops for monitoring and continuous planning. Danuta McCall is responsible for services delivery at Facilitate.com, a collaborative consulting and technology company. She combines business strategy experience and facilitation expertise to help clients across a wide range of industries integrate people, processes and technology to achieve and sustain competitive advantage. She has experience working at all levels in organizations, including senior managers and executives, facilitating collaboration, problem solving and innovation across organizational boundaries. Prior to joining Facilitate.com, Danuta spent 17 years at IBM where she developed and practiced effective techniques for leading virtual teams. Julia Young is a founding partner of Facilitate.com. She is an experienced consultant specializing in group facilitation, organization development and work process improvement with a unique expertise in Internet collaboration. Julia has worked as an internal corporate consultant and HR manager in the high technology industry and as a senior external consultant to government organizations and large corporations in industries such as oil and gas, electric utilities and retail. At Facilitate.com Julia has worked to design and implement practical collaboration tools for the meeting room and Internet. Combining the logical mind of an engineer and a facilitator�s attention to group process, Julia seeks to explore how technology can augment our effectiveness as facilitators. How would you classify the FacilitatePro software? Is it a document-driven DSS? group DSS? model-driven DSS? Who is the targeted user for FacilitatePro? What is the major benefit of FacilitatePro? Why? What is the key challenge when using DSS to support strategic planning? McCall, D. and J. Young, "Bringing Strategic Planning Online: Eliminating Static from Collaborative Strategic Planning", DSSResources.COM, 06/16/2006. Danuta McCall provided permission to publish this article on Tuesday, February 21, 2006. This article was posted at DSSResources.COM on June 16, 2006.